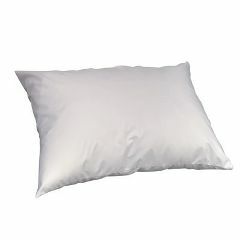 Standard Size 19" x 27"
The Allergy Control Bed Pillow is a soft, supple, quiet cover with hypoallergenic fiberfill. Excellent, high moisture vapor permeability for comfort. Good air porosity for a fluffier pillow. Easy to maintain, self-deodorizing. Extremely small fabric pore size (<10 microns) creates a barrier to lint, dust, dust mites and their by-products. Machine washable. Made of 100% polyester fiberfill. 19" x 27. Breathable, lint free, lightweight and no coatings to flake off or delaminate. Antimicrobial protection using EPA registered antimicrobial technology provides effective control of microorganisms commonly associated with health problems and lasts the life of the product. Can be laundered in a home or hospital setting, does not require dry cleaning. I'm thinking about buying another one. The first pillow I've had that does not get flatten. It's soft and comfortable. The pillow is very fluffy. I haven't had really hot weather to test if it will keep my head cool yet. I have not washed it yet to see if it holds up. What is the size of this pillow? What does Standard Size mean?